The time was late 1954. Jack Homel, a San Francisco native and trainer for the Detroit Tigers, was living in Hot Springs, California during baseball’s off-season. While home, he liked to frequent "Diamond" Mike Gilardi's bar in nearby Petaluma. 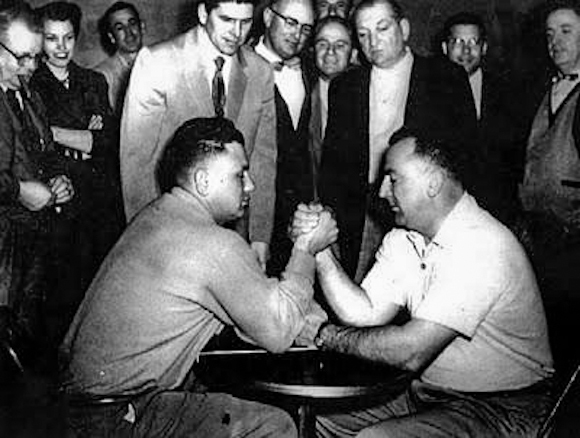 Jack had been involved in professional sports as a trainer for almost 20 years, and liked to boast that he had never lost a wristwrestling match, despite having faced hundreds of opponents including football players, boxers, strong men, steel workers, and longshoremen. 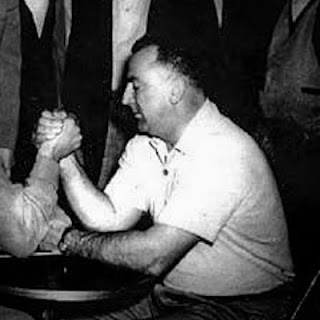 Bill Soberanes, a columnist for the Petaluma Argus-Courier and regular patron of Gilardi’s Corner, heard about Jack’s wristwrestling exploits and learned that, via Mike, Jack had issued a challenge to anyone who thought they could beat him in a wristwrestling match. The story of the challenge spread, and before long, a candidate emerged: Oliver Kullberg. 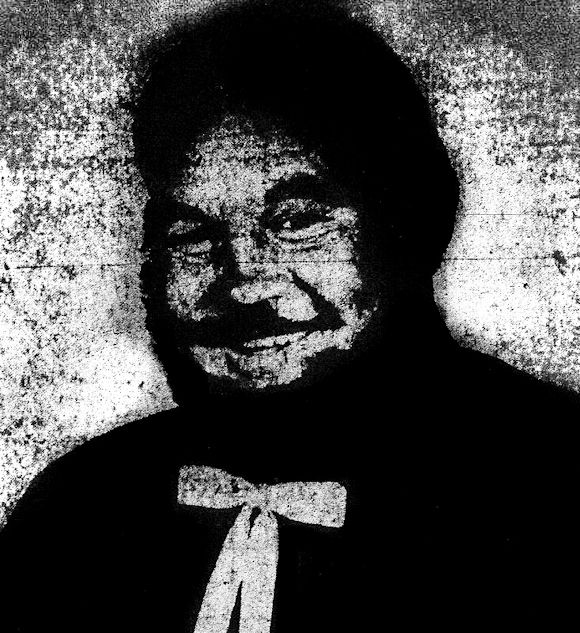 Oliver Kullberg was a 200-lb rancher from Lakeville, California (just outside of Petaluma) who had a reputation of being the strongest man in Sonoma County. He too had never lost a wristwrestling match. Recognizing the possible appeal that such a match could have among the local population, Bill took steps to get the match linked to a series of March of Dimes fundraising activities (a non-profit organization set up to combat polio). Gilardi’s Corner would sponsor the match. The contest would feature free admission and all would be invited to attend, however donations to the March of Dimes would be encouraged. The match occurred on the evening of Thursday, January 27th, 1955. While not a capacity crowd, there were enough interested spectators to create an air of excitement. 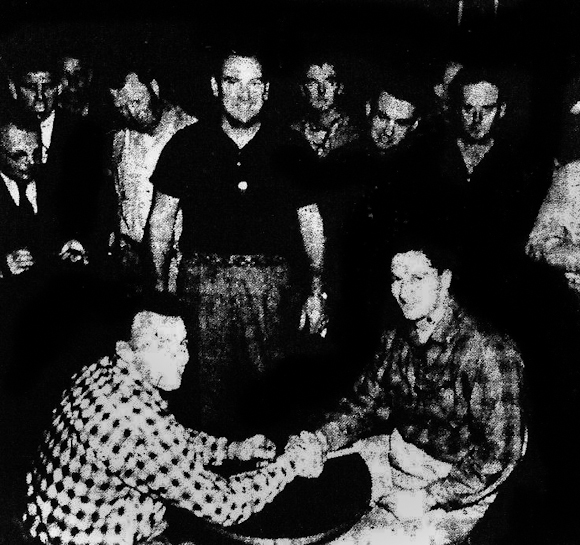 The match was contested sitting down using a round table, with non-competing hands clasped in the center. Once the match started, the two men were very evenly matched. They struggled for close to three minutes until the table collapsed, at which point the referee declared the match a draw. In the days following, the match became the most talked about sport subject in Petaluma. Bill saw how much the crowd enjoyed the spectacle and thought a wristwrestling tournament would be a great idea, so a three-member committee was formed to discuss future events. The committee included Bill Soberanes, Mike Gilardi, and Jack Homel. Oliver Kullberg and Jack Homel’s historic match (Oliver on the left, Jack on the right). Bill Soberanes is the fourth person standing from the left. Mike Gilardi is the third person standing from the right. The committee agreed that winter was the best time to host the annual event, as it coincided with March of Dimes fundraising activities as well as Jack Homel’s off-season. This was important as Jack would be the contest referee. A date of Thursday, February 9th, 1956 was set for what was billed as the Second Annual March of Dimes Wristwrestling Contest. Bill Soberanes, who wrote a daily column for the local newspaper, was able to use his pieces to promote the event in the days and weeks leading up to it by talking about the people who were expected to compete, as well any other planned entertainment. The event was to crown the Petaluma Wristwrestling Champion. 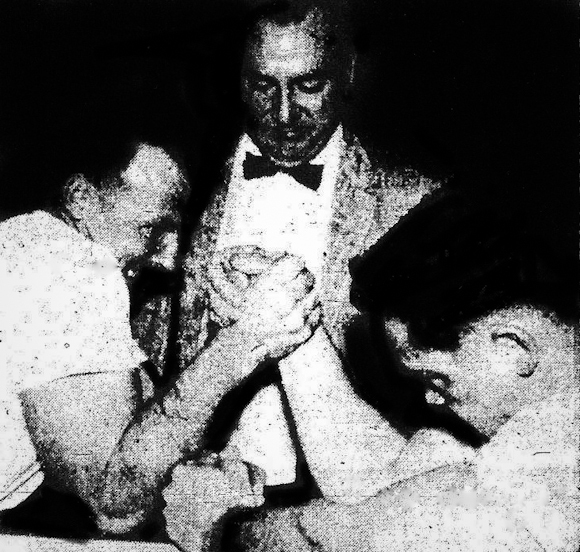 The 1956 contest featured five competitors: Oliver Kullberg (the 1955 co-champion), Cliff Parlee (a former weightlifter and San Anselmo policeman), Harry McNulty (a top amateur boxer and car salesman), Barton Garihan (a native Petaluman), and Jack Kreider (from nearby Two Rock Ranch). Because Jack Homel opted to officiate rather than compete, Oliver was seen as the man to beat. The type of table and basic rules that were used in 1955 were again used for the 1956 contest. It was a single elimination affair with a single open weight class, so the entire tournament only consisted of four matches. The final match pitted Cliff Parlee against Oliver Kullberg, and though there was a struggle, Cliff emerged champion. He was declared the winner of the contest. However because San Anselmo was in Marin County, not Sonoma County where Petaluma is located, Oliver was able to retain his title of “Champion Wristwrestler of Sonoma County”. Attendance at the 1956 event was up from the 1955 contest, both in terms of competitors and spectators. Bill wanted to try to continue to grow the contest, and so more attractions were added for the 1957 tournament. That event would feature Augie Lepori, a popular Petaluma personality, as the master of ceremonies, and local politicians were invited to take part in an exhibition match. The 1957 contest was held on Wednesday, January 23rd. This time seven or eight men took part in the competition. At least one match ended in a draw (no pin after three minutes), and the winner was determined based on hand position. 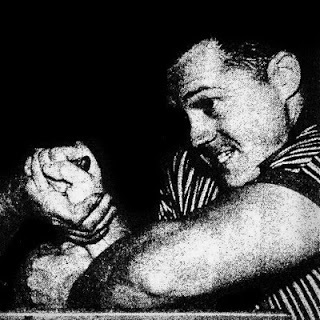 In the end Charley Petersen of Petaluma beat 1956 champ Cliff Parlee to earn the title of Champion Wristwrestler of Northern California. 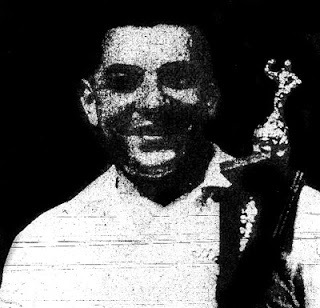 Another special title was bestowed at the 1957 contest: Jack Homel was crowned the “Wristwrestling Champion of the World”. 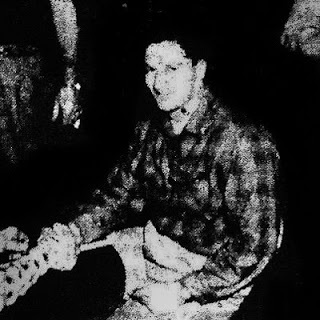 By this time, Mike Gilardi had made repeated attempts over a two-and-a-half year period to set up a match between Jack and Mac Batchelor, the Los Angeles bar owner who was recognized by most as the World Champion, due to his perfect record in the game in almost 25 years of facing all comers. 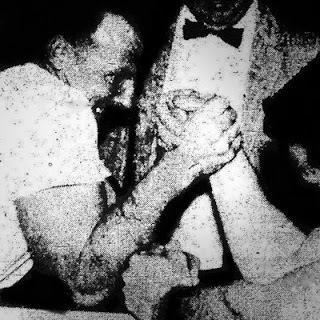 Mike first set out an invitation to Mac in late 1954 once he had learned of Jack’s wristwrestling exploits. Mr. Gilardi was convinced it would make for an excellent match-up. When it was later discovered that Mac had lived in Petaluma in his younger years (his father operated a real estate and insurance business there), there was increased hope that Mac would accept the invitation. Mac never responded, and when he formally announced his retirement from the game in 1956, Bill and Mike felt that crowning Jack with the title of World Champion was justified. 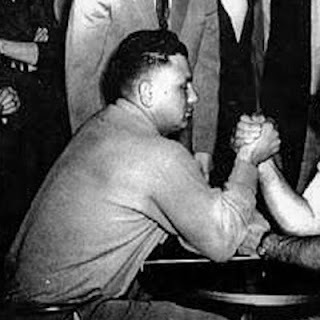 They were still hopeful that Mac would attend the 1958 event to give Jack an official shot at the title. Mike was so confident that Jack would win the match that he offered to pay Mac his expenses to come to Petaluma. However, unfortunately the match never materialized. Despite Mac’s absence, efforts were made to increase the entertainment value of the 1958 March of Dimes Wristwrestling Contest (also referred to as the Petaluma Centennial Wristwrestling Contest that year as it coincided with Petaluma’s 100th anniversary of incorporation). The event was now to crown the champion of the entire state of California. Many local sports and entertainment celebrities were in attendance and there were a number of exhibition matches, including a women’s match. Prior to the wristwrestling contest, a number of variety acts were presented, including a duck calling demonstration, accordion music, and a magic show, among others. A specially-designed stand-up wristwrestling table, set up on a platform, was used for the contest. A microphone and sound system was used for the event, which hadn’t happened for any of the preceding contests. The 1958 tournament featured 13 or 14 competitors. Some came with “managers”. The bar was packed to maximum capacity, and many others simply couldn’t get in to see the show. The final match pitted Earl Hagerman, a salesman from Santa Rosa, against Charley Petersen, the 1957 champion. Earl ended up winning the contest to be crowned the California Champ. A great time was had by all and several hundred dollars were raised for the March of Dimes. Over the next three years, the Petaluma wristwrestling contests continued to grow both in production scale and in spectator and competitor interest. Though the contest remained limited to California residents, men kept coming from farther and farther away to compete. A variety of actors, public officials, and current and former professional athletes would attend, making the events huge draws for the people of Petaluma and the surrounding area. Since the contest’s inception, no champion had been able to win the title twice. This changed in 1959 when Earl Hagerman defeated Petaluma resident Harvey Ballestrini in the final match in four seconds. Earl’s win earned him a large trophy, and of course bragging rights. Though Earl was the California Champion, Harvey was recognized as the Champion Wristwrestler of Petaluma. The mayor of Petaluma, Arthur Parent, was in attendance and he predicted that “This [event] will put Petaluma on the map all over the world”. 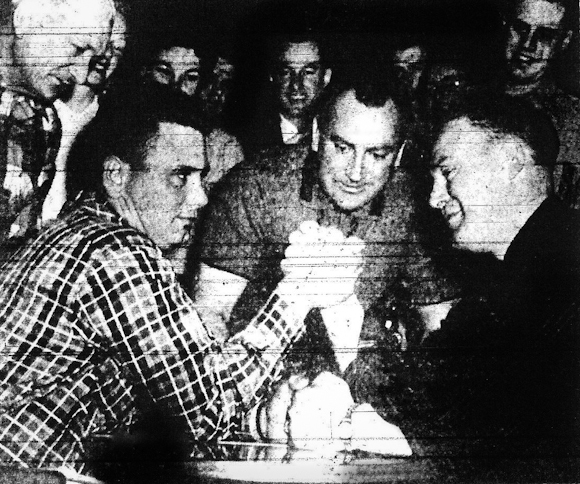 Earl Hagerman repeated his success at the 1960 contest, finishing atop a field of over 20 competitors after winning the final match with Bert Crosby of Ukiah. That contest also featured a left-handed division, which was won by Joe Mattos of Petaluma. Two very big men competed for the first time in the 1961 contest in hopes of dethroning 5-foot 8-inch Earl Hagerman. 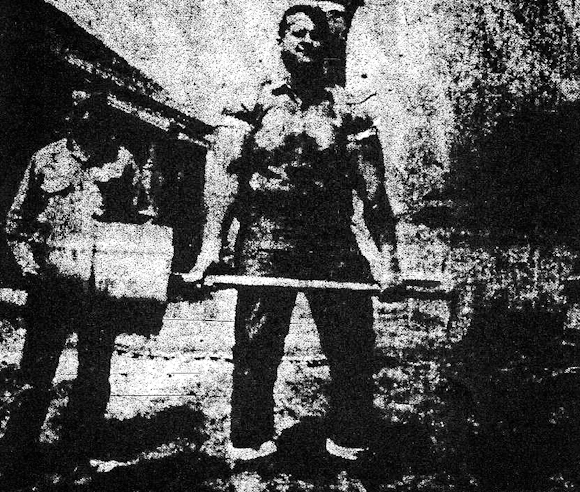 The biggest man to enter the contest yet, 6-foot 4-inch, 305-lb lumberjack Ray Ross from Elk (who sported 22-inch upper arms) had his quest cut short when he ran into Duane Benedix, a 6-foot 4-inch, 260-lb electrician from Livermore, and lost a 40-second long match. Duane ended up meeting Earl in the final match, and won the grueling minute-long match to be crowned the new Wristwrestling Champion of California. An equally big man attended the 1961 contest, but not to compete: he was there to add color to the event. 6-foot 6-inch, 290-lb Chet Shandell, who played the part of Paul Bunyan (the greatest woodsman that ever lived) for many years at the annual Paul Bunyan Days Festival in Fort Bragg was invited to appear in full costume with his giant axe. He would go on to become somewhat of a goodwill ambassador for the contest over the next several years.